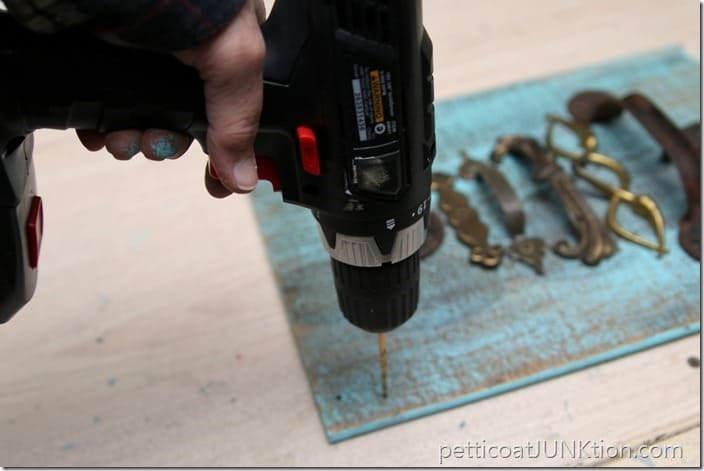 I made a special hardware Christmas tree for our Home for Christmas Blog Hop. I’m joining fellow Hometalk DIY bloggers to bring you a bunch of new Christmas projects, home tours, crafts, and more. 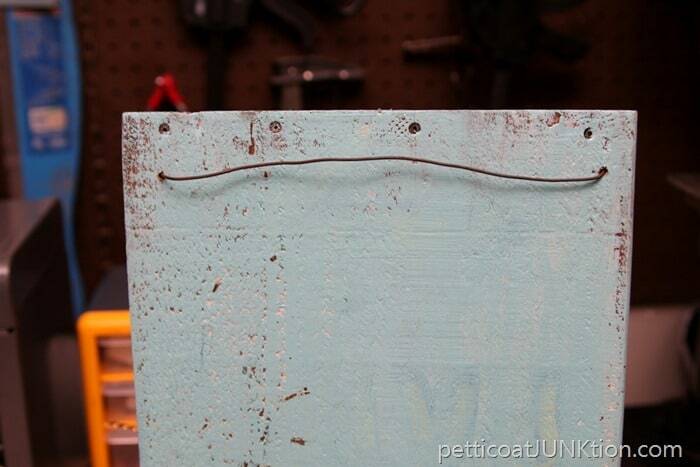 My project is a “tree” from reclaimed hardware. The photo above shows a small part of my rusty treasures. 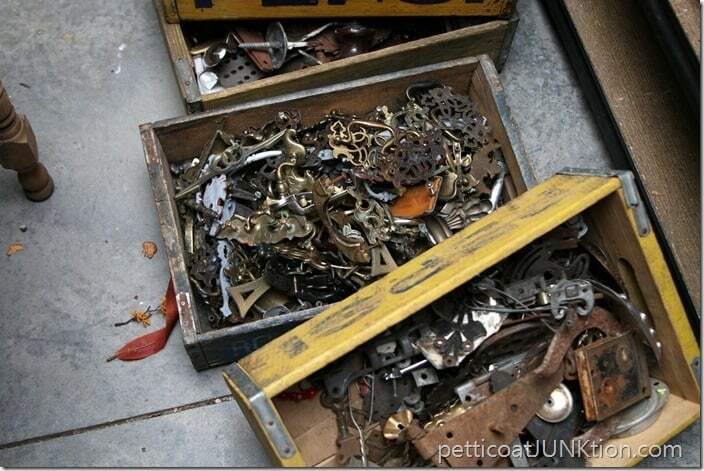 Most of you guys know I have a whole stash of hardware and junk finds. 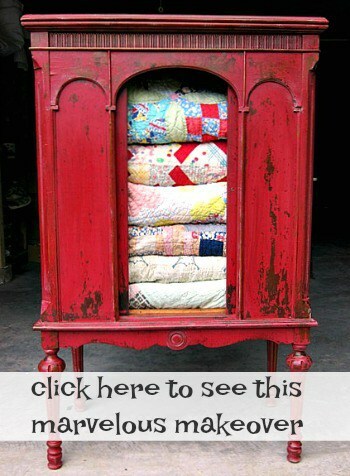 Subscribe by email to Petticoat Junktion updates and come along with me on my flea market and junk shop adventures. I pulled a few pieces of hardware to work with and also sorted through my sparkle and bling pile to find a suitable topper for the “tree”. I dusted off the hardware and gave it a coat of Howard’s wax in Golden Oak. 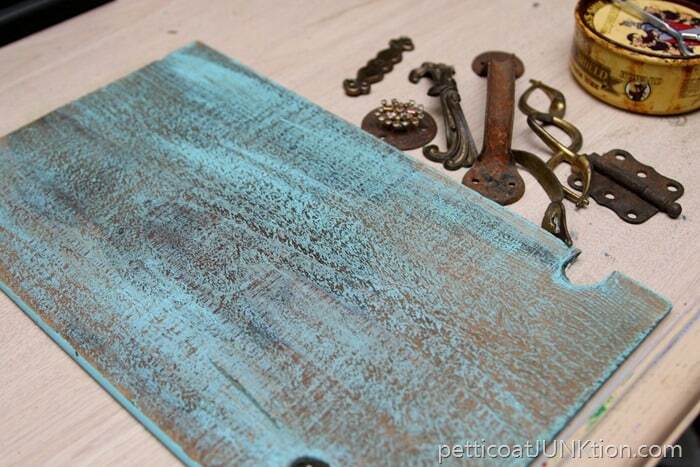 The board is a reclaimed drawer bottom dry-brushed with a little turquoise paint. I attached the hardware and bling to the board using hot glue. I keep my hot glue gun corralled in a stainless steel canister that make the perfect stand. I tend to burn myself with that thing if I don’t keep it out of the way. I drilled a hole on either side of the board near the top and added rusty reclaimed wire as a hanger. The wire is pulled through the holes and twisted into loops on the front side. 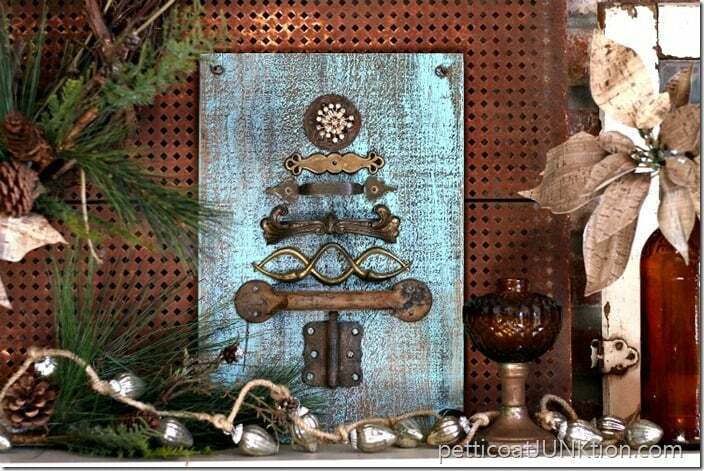 I added the sparkle and rust hardware Christmas tree to the rustic mantel display I shared last week. 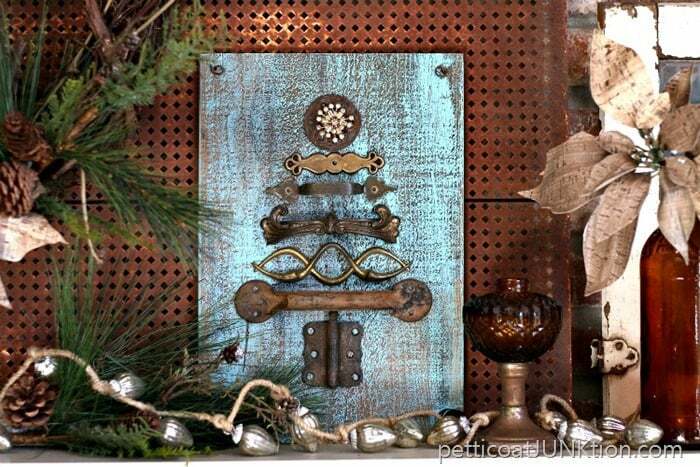 The turquoise color and the rusty hardware work well with the amber glass pieces. The new “tree” is a more colorful version than the first tree I made in 2012. The original hardware Christmas tree was a big hit. I’m always a little leery about trying to re-create a project. The re-creation is never as good as the original. What do you guys think of the new tree? How does it compare to the original? You can see the original by clicking here…..Hardware Christmas Tree Version 1. Gorgeous! 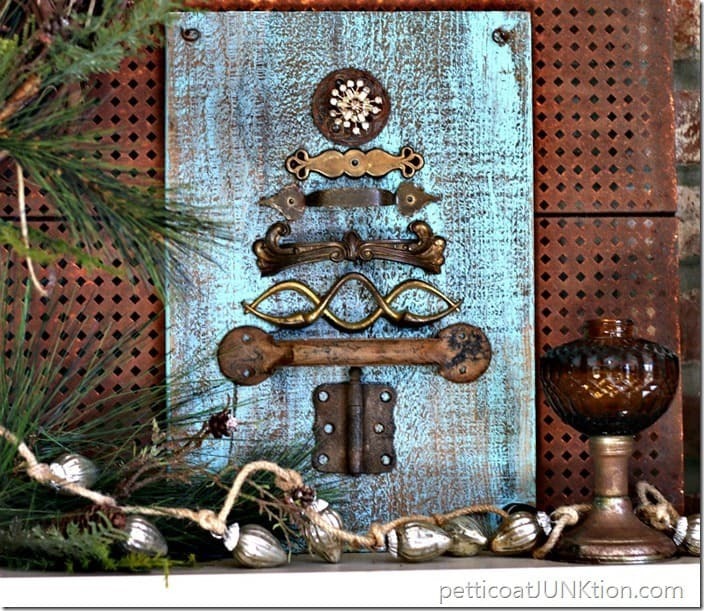 I love how you reused old hardware and I think the new color is fantastic! Thanks for sharing on Merry Monday! Both trees are pretty spectacular! Very creative. Thanks for sharing! I like it better than the 2012. Love the turquoise color. Thanks for sharing this idea. Wow! These turned out great! I love the turquoise wash you gave the board. So pretty. I simply LOVE your junk tree. 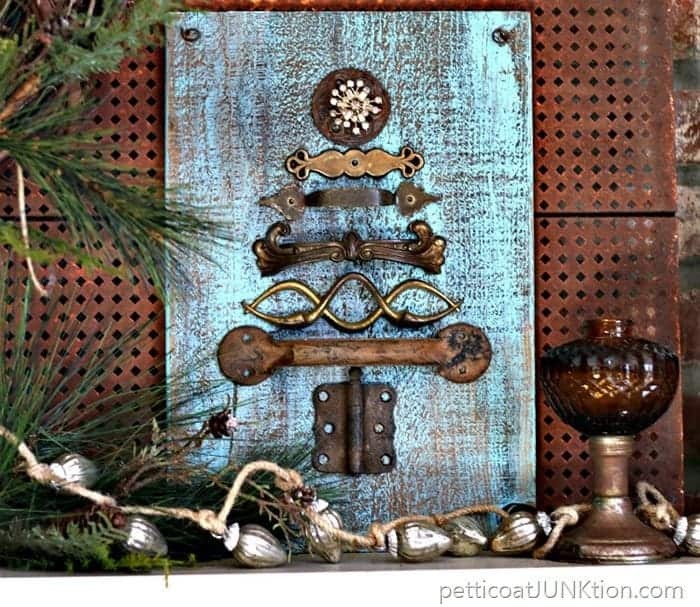 The color combo of the turquoise and rust is just so pretty! Love them both but am partial to smaller one!! Love your talent and imagination!! Merry Christmas ! This one is better in my opinion! It’s the turquoise and the top piece – just wonderful. 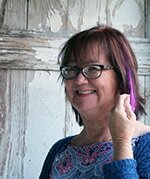 Did you share how you did the turquoise? Couldn’t find anything – care to share? It’s a great project for sure…. You want to know which we like best . Oh that is a hard one, but I guess if I had to I would say the first one, but only because I love the blue back ground more that the white. I think it goes better with the rust. Ohhhhh Kathy…. 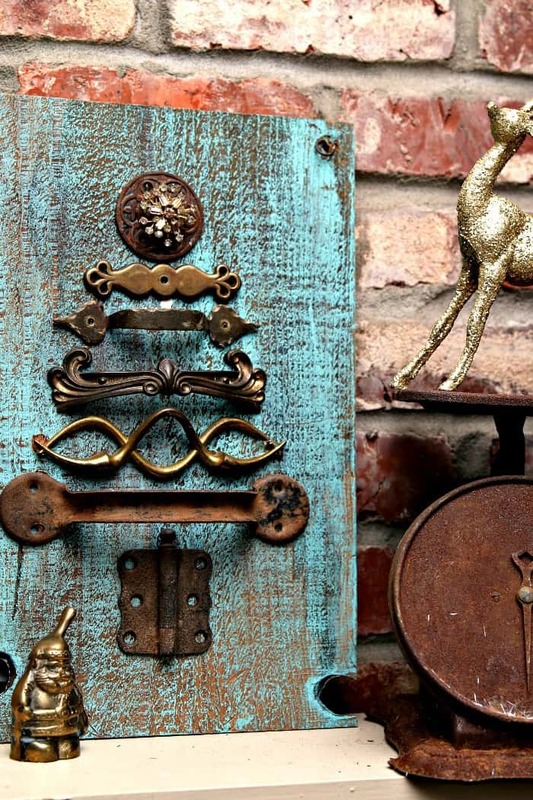 all I want for Christmas is for Santa to deliver me a little more junk, so I can make cool things like this. ADORE! Kathy, I’m featuring your awesome Christmas Tree at the DIY Sunday Showcase Party this weekend. Thanks for linking up with us and Merry Christmas! Wow Kathy – this tree and art are adorable! You are always so resourceful and creative! Happy to be on the hop with you! Merry Christmas! This is so cue and fun! Love it! Your tree is amaaaazing! And I am so jealous of your stash! I really like those “trees” and will have to make some myself next year!!! Another beautiful creation Kathy! Merry Christmas! Be still my heart, Kathy you have a great stash of goodness. Oh my! Love the tree art! This is FABULOUS!!! So creative. I am definitely going to give this a try. I love it, and I am pinning it. Thank you, Kathy! Merry Christmas. I am enchanted with your second one. I think the turquoise adds a spark. I think the first one almost has too many pcs , but both are very clever. Keep your good stuff coming. This is too cute, Kathy! 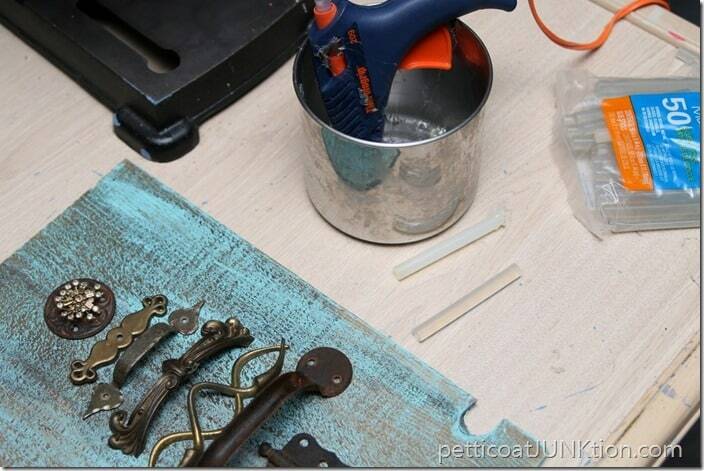 Gotta pull out my rust junk box and find things to make it – pinned it! Now those are adorable! What a great idea! Merry Christmas!